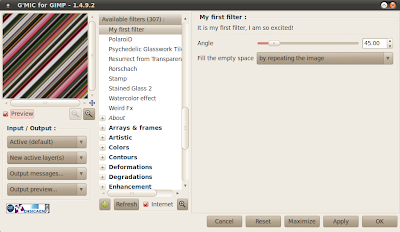 Using GIMP 2.6.11 and G'MIC 1.4.9.2. You can download G'MIC for your specific OS, here. First let me state that I didn't come across this idea on my own. 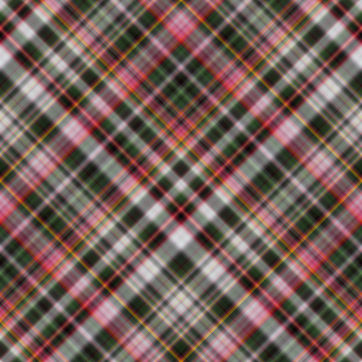 I've been following a conversation at Gimp Chat, that discusses various methods of creating plaid designs. You can follow that discussion here. 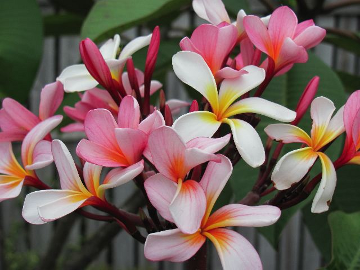 Akky shared a few beautiful flower images on Gimp Chat. One in particular was to my liking. You can view this image and others here in the same thread. This image is scaled, to get the larger image grab it from Gimp Chat. Rod shares how to smooth the palette of colors here - (Colors/Info/Smooth Palette). This is good information to know, but it doesn't create a 45 degree diagonal palette. It would be nice if there was such an option. If you need more help on finding or creating the .gmic file, even after following Zonderr's tutorial below, post a comment here or at Gimp Chat, or at G'MIC Flickr. Lucky for us G'MIC users, Zonderr taught us to create a clever little beginner's filter, here. It's simply titled "My First Filter". It's a nifty filter and it does the job we need it for. 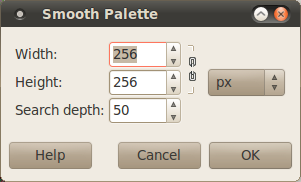 With your image containing the smooth palette, as shown above, go to Filters/G'MIC. Note ALL of the settings on the G'MIC menu, including Input/Output. When you have made all the necessary changes to your selection, press APPLY, not OK.
Change the angle to 90 degrees and click APPLY again. TIP: Make sure to pay attention to your Input/Output settings. Step 1 and 2 Input settings are "Active Default" and Output is "New Active Layers". In step 3, Input mode changes (see below). In steps 4 & 5, for both steps, Input is "Active Default", Output is "In Place, default". Switch to Layers in G'MIC and select the Average layer. 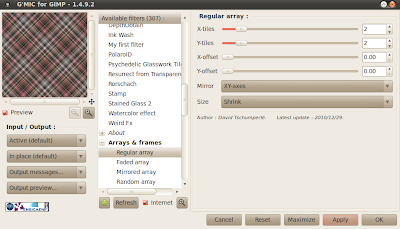 Under Input/Output, change the top Layer option to "Active and below". Let's give it some cloth texture. Go to Patterns and select Canvas (be sure to make sure the 2nd direction is activated). For the tutorial, I used default settings. Change Input to "Active Layer" and Output to "In place, default". Click APPLY, not OK. 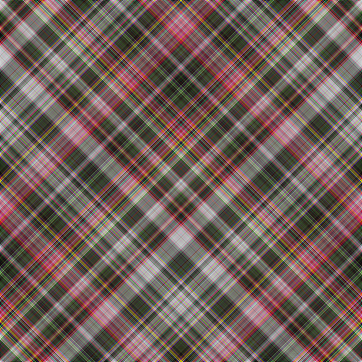 This looks more cloth-like, but its not seamless. It might seem like a lot of work the first time around, but it actually goes very fast, as long as you remember to change the Input/Output settings when needed. Enjoy! Very interesting, not just your tutorial but Zonderr's tutorial and the discussion as well. I guess I now know where everybody from Gimp Talk went. Thank you.